"Just 35 Minutes by the Best Carline"
"We are of the city, but not in the city. We are in the country, but not of the country." Providing the best of both urban and suburban worlds, Chevy Chase School consistently promoted its ideal suburban location as a factor which distinguished it from other private schools for girls and young women in the Washington metropolitan region. Like other Chevy Chase institutions along Connecticut Avenue, the school benefited from the electric trolley line. 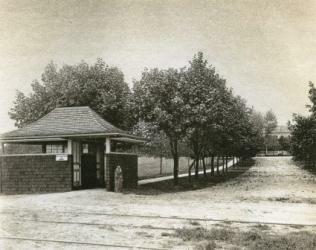 The Rock Creek Rail Line, opened in 1892, was constructed at immense expense by the Chevy Chase Land Company to promote land sales for their planned development of a “fashionable” suburban residential community. New homes built in Chevy Chase had to be worth $3,000 to $5,000 in the early years of the development, so only very wealthy households could afford to build in Chevy Chase. Although there were no racial or religious covenants in the early land sales, these financial requirements had a similar effect. 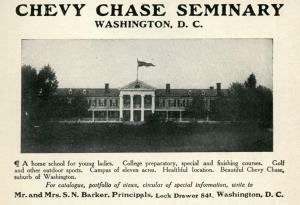 Thus, the “fashionable” location of Chevy Chase Junior College was exclusive in all senses of the word. 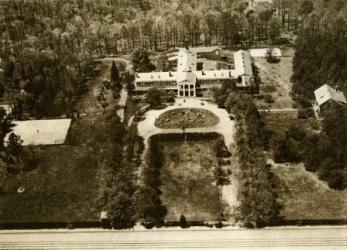 The building that would become the center of the Chevy Chase School was originally built by the Land Company as a suburban resort hotel, with the hope of attracting potential land buyers. Opened in 1894 as the Chevy Chase Spring Hotel, and later known as the Chevy Chase Inn, the hotel failed to attract sufficient patrons, especially during the winter months. In 1895, the Land Company leased the property for one year to the Young Ladies Seminary. The school only lasted that year. But in 1903, Dr. and Mrs. Samuel Barker bought the hotel for use as a new school for girls and young women, to be called Chevy Chase College. From the very beginning, the convenient and socially desirable location would be highlighted as a main advantage in promotional materials. And it was, as these accounts often stated, just a 35 minute ride by trolley from the school to downtown Washington, DC.